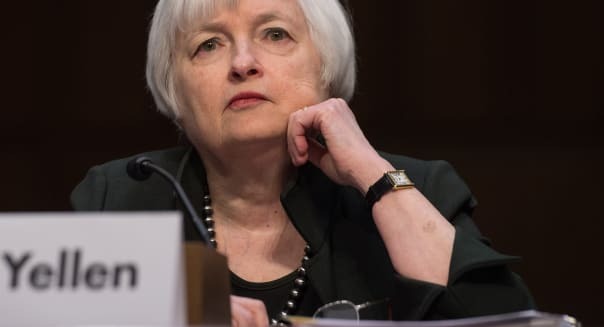 WASHINGTON and PHILADELPHIA -- Federal Reserve Chair Janet Yellen has the evidence of U.S. labor market health she wanted in order to raise benchmark interest rates for the first time in a decade this month, but she may have a tougher time selling further hikes. Yellen's arguments against potential dissenters at the Dec. 15-16 Fed policy meeting were strengthened by Labor Department data Friday that showed employers hired 211,000 people in November while even greater numbers joined the workforce. Federal funds futures contracts imply a 79-percent chance that the Fed will end seven years of near-zero interest rates at its December meeting and about even odds of a second rate rise by March. Beyond that the outlook is more mixed. Interest rate futures maturing in the second half of next year are rising slightly, showing traders are wagering the Fed will manage no more than two further hikes before the end of next year. %VIRTUAL-pullquote-You have an open debate between doves and hawks as to what the pace of increases should look like.%The differences among Fed policy makers were on display at a Philadelphia Federal Reserve conference Friday where Narayana Kocherlakota, in his last speech as president of the Minneapolis Fed, gave a sharp critique of a central bank that he said was too anxious to begin raising rates and thus would fail to create perhaps millions of jobs in a timely manner. James Bullard, the more hawkish head of the St. Louis Fed, followed that presentation with one that argued it is time to raise rates and to begin shrinking the central bank's $4.5 trillion balance sheet which was bulked up in recent years to boost the economy. "You have an open debate between doves and hawks as to what the pace of increases should look like," said Art Hogan, chief market strategist at Wunderlich Securities in New York, referring to the divisions within the Fed over readiness to tighten monetary policy. The Fed has appeared gun shy on tightening policy twice already this year, in June and September. Its key policy rate has been 0-0.25 percent since the depths of the financial crisis in late 2008. Wall Street's top banks said Friday in a Reuters poll that they expect the central bank to maintain a slow pace of rate hikes, with the median forecast for the fed funds rate for mid-2016 about 0.75 percent and 1.125 percent for the end of the year. The Fed's policymakers hold very different views of where the central bank's benchmark rate will end next year, ranging from less than zero to 3 percent, according to projections released in September that were based on their views of appropriate policy. The median outlook was for four quarter-point rises next year, while their views of the long-term normal level range from between 3 percent and 4 percent. Worryingly for a consensus-seeking Yellen, it isn't just traditional "doves" such as Gov. Lael Brainard who are questioning the pace of rate rises. Even some of the hawks, who would typically worry more about inflation risks than weak economic growth, are weighing a possibility that they may face a long spell of below normal economic growth and low inflation. Bullard noted that rates have remained low in most advanced economies. If that persists it "may be leading us to an outcome with low nominal interest rates and low inflation that can last for a very long time," he said, adding the Fed needs to be willing to pause and also to speed up its pace of tightening. Earlier this week, Yellen said the process of rate increases could be gradual but she has yet to spell out what gradual means. One driver for the pace of rate rises will be whether inflation picks up next year, and Friday's data suggested workers might not be getting big enough raises for businesses to raise prices much. Friday's jobs report also highlighted Brainard's argument that weakness in the global economy could constrain U.S. growth more than policymakers currently expect. Manufacturing jobs, which are among the most exposed to the global economy, actually fell by 1,000 in November, the third drop in the last four months. "While this report can help justify a rate hike in December, it can't justify anything more than a very gradual path of rate hikes," said Brian Jacobsen, a portfolio strategist at Wells Fargo Funds Management in Menomonee Falls, Wisconsin. -Ann Saphir in San Francisco, and Dion Rabouin and Rodrigo Campos in New York contributed reporting.